The Social Style model is over 40 years old and is used by thousands of organizations to impact human relationships for the better. 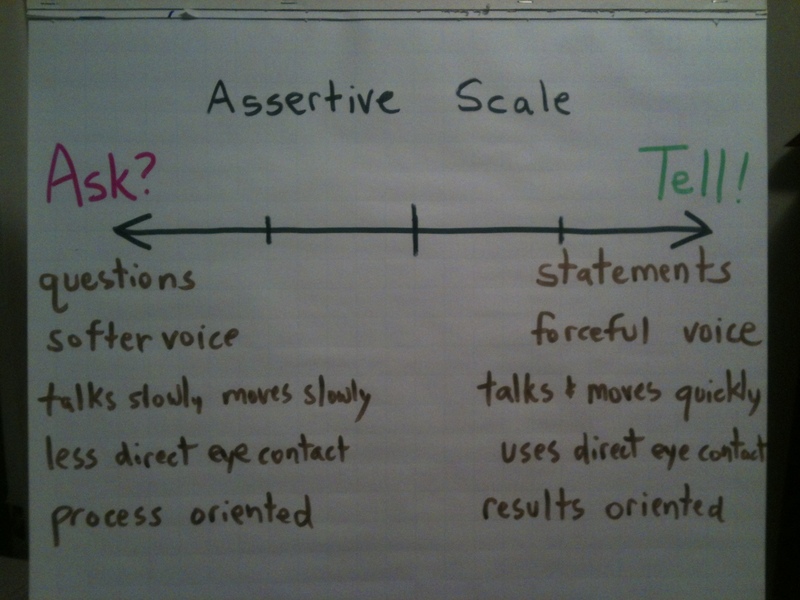 Social Style describes people on the assertive continuum from Ask to Tell. Ask assertive people are slower to decide, ask more questions (because they are questioning every situation), are less aggressive, and more process oriented. Tell assertive people make decision more quickly, make more statements (because they are more sure of themselves), are more forceful and more results oriented. Tell assertive people interrupt. Ask assertive people almost never interrupt; to them it’s rude. This Model is used in dozens of cultures on the planet. I am a North American Tell assertive. One of my tell assertive tendencies is to assume my way is the best way in almost every situation. It isn’t always the best way of course but that assumption gets me in trouble. First of all, I’m delusional when I assume I’m right and make mistakes I shouldn’t make. Secondly, being so sure of myself irritates others. It appears arrogant. Thirdly, I can influence Ask assertive people to shut down and disengage by my Tell assertiveness. That creates barriers in my relationship with them in the near and long term. So, I use this particular aspect of Social Style in many circumstances. In sales situations, I try to ask lots of questions and invite the prospect to collaborate with me. I try to focus on not having a selfish focus. When managing and coaching others, I focus on being a better listener even when I need to deliver an important message. Listening and collaborating are desirable skills for all of us but we Tell assertive people need extra concentration here. Of course, Ask assertive people need almost the opposite advice. They are naturally good listeners and collaborators. Their real need is to focus on being bold and forceful with their ideas and opinions. They need to stand up, look people in the eye, talk with power, volume, and conviction, and expect people to accept their words. I’ve seen this model help in personal relationships as well as business relationships. I’m also convinced that many conflicts between cultures and even nations could benefit from understanding each other using the Social Style Model. I know my own marriage has benefited when I realize when my wife makes a suggestion to me it’s really a request. And when she realizes when I’m being “bossy”, I’m just trying to be efficient, not overbearing. There are really no relationships that cannot benefit from learning more about Social Style.